he Club is closed for all activities today, Monday, Dec. 21. 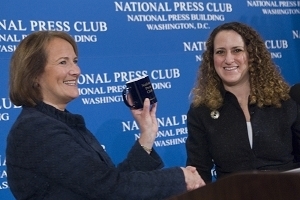 It is the National Press Club's policy to close when the U.S. government closes. The U.S. Office of Personnel Management  ( http://www.opm.gov/status/ ) announced at 4:35 p.m. Sunday that the federal government is closed on Monday due to the snowstorm. The Club will reschedule its speakers luncheon featuring NIH director Francis Collins. The Board of Governors will meet Tuesday at 6:30 p.m. However, in the spirit of the snow day, the Club will celebrate official "Make a Snowman Day" with a contest. All Club members are encouraged to make a snowman (or woman). Please submit a photograph of your snow creation to president@press.org . The best snow creation will win a prize. Children of National Press Club members are eligible. Extra points will be awarded for a news theme.